Dora Garcia. “Ulysses,” since 1999. Trimmed book, unlimited edition. It is difficult to think about art these days. Witnessing the world unravel in daily news reports makes questions of culture seem superfluous. If there is any art to worry about, it would seem to be the material culture of ancient civilizations that are the constant casualty of an endless American-led war in the Middle East. The Western world gasps—though less and less each time—when the Islamic State explodes another ancient monument in Palmyra. But do we also shudder when the governor shuts down the entire Illinois museum system while blazing a warpath of budget brinkmanship? In the decade and a half since September 11, political definitions of terrorism have been stretched to elastic extremes, so much so that the term can be used to equate events that are seemingly very disparate in order to expose their shared logic, like the destruction of global cultural heritage by distant, non-sovereign entities in Syria and the state-condoned strangulation of civic efforts to preserve local culture in Illinois. And yet, art remains the least of our concerns when terrorists are on the loose. 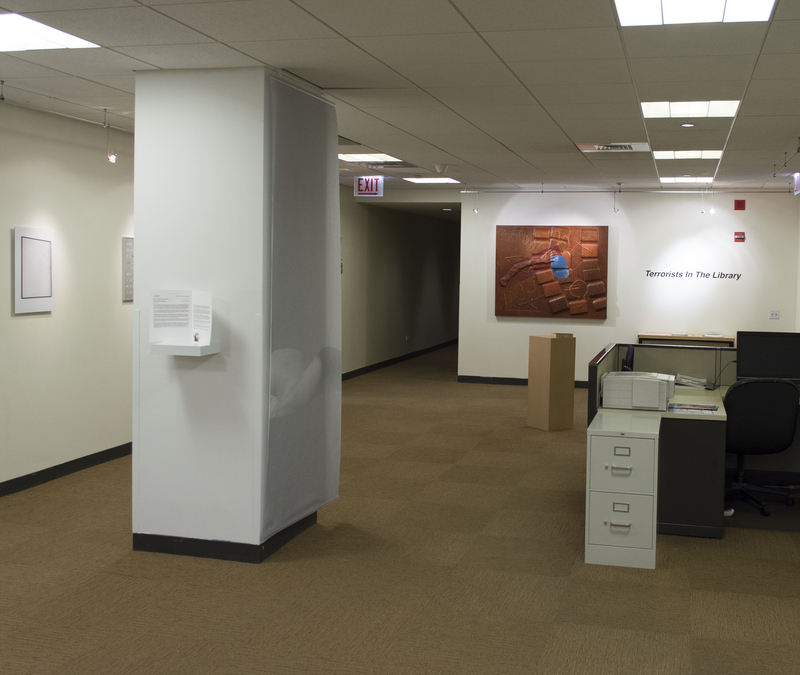 Given the current political climate, a publicly funded institution like the Harold Washington College would seem an unlikely host for an exhibition titled “Terrorists in the Library,” on view through November 24 in the little-known President’s Gallery on the eleventh floor of the college’s downtown facility. In hindsight, the setting of the exhibition is all too perfect. To access the gallery, a visitor must surrender her driver’s license as collateral for a microchipped card that allows access to the building through a bank of intimidating electronic security gates. Once upstairs, a shabby hallway leads to an exhibition area carved out from the leftover space between several administrative offices. The gallery is not clearly demarcated, and around every corner are cubicles, copiers and office doors. In this context, a visitor to the show cannot help but feel like an infiltrator, or else a paranoid investigator. “Terrorists in the Library,” 2015. Installation view at President’s Gallery, Harold Washington College. Within the designated gallery space, a menagerie of faux leather lounge furniture and an empty reception desk cohabitate with sixteen artworks made by nearly as many artists. A few works seem to address the titular theme head-on: a collection of laminated barcodes excised from library books are mounted and framed under glass as if presented by a trophy-hunting lepidopterist (Jase Flannery); a vinyl wall text declares an artist’s ongoing efforts to white-out and revise certain published dates in library collections (Dario Robleto); a seemingly endless digital video shows a pile of leather-bound tomes burning in slow motion to an eerie voiceover and strange music (Ajax Athena). Herein, the library and the college, both stable sites of research and knowledge, are subject to a violent reorientation toward uncertainty, and information is at risk of being attacked by art. When art is under attack, whether by the Islamic State, the governor of Illinois, or conservative soldiers of the culture wars, the default defense proffered by cultural workers is that art should be saved because it offers things to society that other forms of material production cannot: namely, beauty, imagination, historical memory and other noble intangibles. Ironically, the unintended consequence of such an argument is that it submits to the very notion of instrumentalization that many proponents of culture otherwise resist as being anathema to the essence of creativity. To argue for the value of culture is to admit to a certain extent that its value needs to be quantified, just as per capita income, tax revenues and gross domestic product are measured and thus rendered debatable. The growing trend in post-studio practices toward interdisciplinarity and “research-based” art making seems to emerge in part from an anxiety about this question of instrumentalization and value in art. Artists who team up with scientists and engineers or otherwise appropriate the methods of empirical research have gained widespread attention for offering new applications for the arts and for seeming to answer the vexing question of art’s usefulness. Of course, this approach is not without its detractors. Last month, New York-based art critic Lee Rosenbaum wrote a brutish review of a current exhibition of work by the Lebanese artist Walid Raad at the Museum of Modern Art in New York. In response to the artworks’ elaborate mapping of international economic and cultural development conspiracies, Rosenbaum criticized the art for playing “fast and loose” with “matters of public interest.” She accused Raad of distorting reality to malign prominent cultural institutions such as the Guggenheim Museum and the Artist Pension Trust, which the artwork casts as being complicit in labor violations and art-market manipulation, respectively. Jase Flannery. “Aiding and Abetting Blumberg,” 2015. 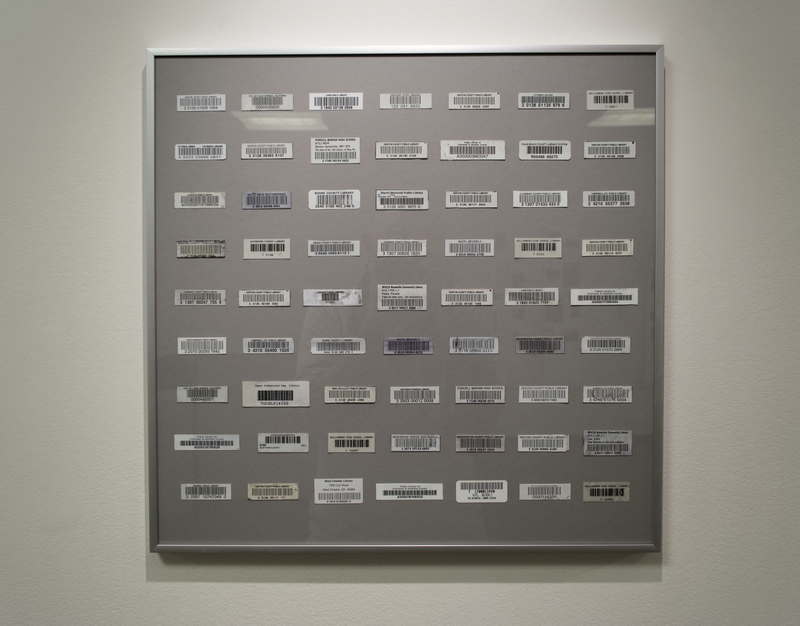 Framed collection of removed library security tags. 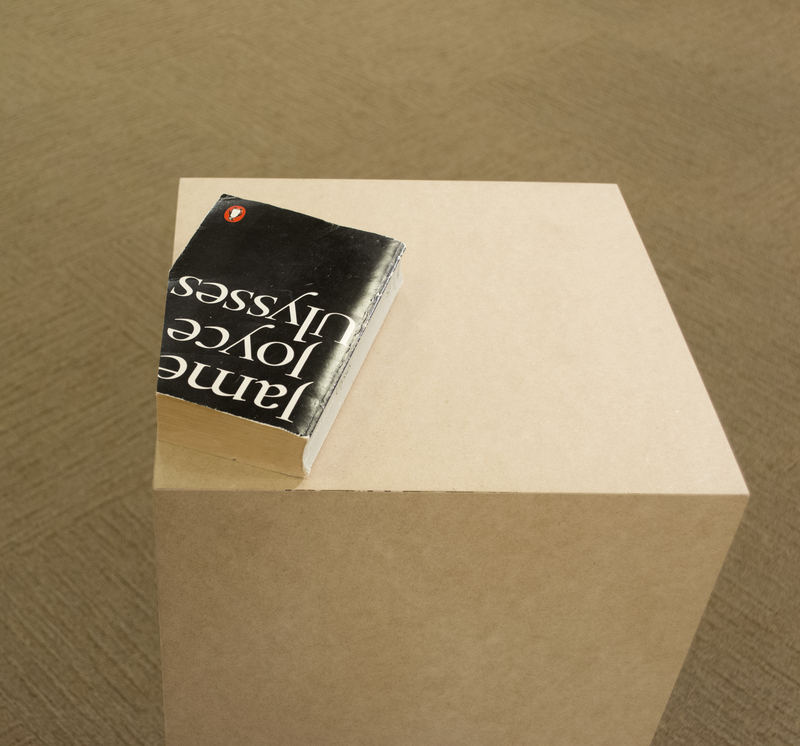 Rosenbaum’s insistence that art “tell the truth” reveals the danger of investing a certain kind of faith in research-based art practices—that is, viewing them as a definitive answer to the question of art’s instrumental value. Expecting art to yield “facts” or “information” equivalent to that of empirical research fundamentally disregards the unique capacity of art to grapple with complexity, nuance and ambiguity of the highest order. Ruslana Lichtzier, the Chicago-based artist and writer who curated “Terrorists in the Library,” calls her show a “speculative research project in the form of an exhibition.” Indeed, a visitor to the President’s Gallery would encounter a high level of complexity, not to mention a great deal of confusion, especially if she were expecting either the customary clean abstraction of a contemporary art exhibition or the factual clarity of a library or archive. There are many fact-based installations on display, like an email exchange between an artist (Dan Miller) and the curator explaining why a seditious text cannot be exported from Russia in time for display at the exhibition; or a half-hour audio file that combines personal and public reflections on the aftermath of September 11 (Sarah Mendelsohn and Fred Schmidt-Arenales); or a file cabinet by the reception desk stuffed with mostly blank, mostly empty folders with just a few of them stuck shut with skin-toned paint (Kelly Lloyd). But if the facts are what one is after, one would be better served looking for them elsewhere. Where that place might be, I neither know nor care.